Mind Performance Hacks ISBN:0596101538 is a book by RonHaleEvans, maintainer of the Mentat Wiki. (It also contains hacks from some of the OtherContributors.) The book was published by O'Reilly Media in February 2006. 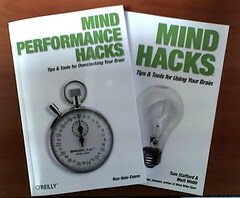 Mind Performance Hacks addresses many of the same topics as this wiki, in O'Reilly's well-known Hacks format. There is some overlap between the book and the wiki, but each contains plenty of new material too. The official home page for Mind Performance Hacks is http://oreilly.com/catalog/9780596101534/, but this page is the central support page for the book. You'll find links to separate pages for each of the book's 75 hacks below, where you can comment on the book, suggest material for a sequel or second edition, make corrections, and so on. All web links from the book have been added to the hack pages below. Share and Enjoy! Read the complete book online (free 14-day trial). Mind Performance Hacks photos on Flickr. Mindhacker, to be published 22 August 2011. Here are the links to the book's hacks, listed by the hack's number and sorted by chapter.